Singular photographs are great tools for sharing a memory, but Google’s photo sphere technology does a little bit more to help recreate an experience. Built in to most current Android phones, photo sphere mode allows you to create 360-degree Street View-like snapshots wherever you are. 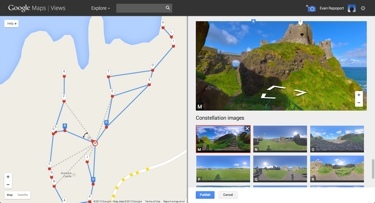 Now, Google is giving you the power to create and share your own unique Street View maps by connecting individual photo spheres via the Google Views service. To create your own Street View on Google Views, you’ll need to upload photo spheres from your Android device or DSLR camera. You’ll then be able to connect your photo spheres on a map using provided tools. You and other Google Maps users can navigate between your Street View shots just like on a normal map, opening up a new virtual world. If you don’t feel up to creating your own photo spheres and Street View experiences, you can take a look at other peoples’ creations instead. The Google Maps Views page gives you the opportunity to browse the most popular photo spheres available, from the ancient Mayan Palace of Palenque in Mexico to the Seychelles coastline to a town destroyed by Japan's Fukushima nuclear reactor. To learn more about photo spheres and how to share them with the world, check out Google’s Photo Sphere page over at Google Maps.